South Africa’s North Gauteng High Court has just ruled that South African prosecutors and police illegally refused to proceed with an investigation of systematic torture in Zimbabwe. South Africa, like many countries, has adopted the international crime prosecution Treaty (“the Rome Statute”). This means that under ordinary domestic law (the ICC Act) the South African investigative authorities have the power to prosecute anyone who has committed torture, or a crime against humanity anywhere in the world, if the perpetrator is in the country (at any time when investigation is contemplated). Jurisdiction is also vested irrespective of the perpetrator’s whereabouts if the victim is a South African citizen. Of course this burden of responsibility teems with diplomatic difficulties, but generally it has been discharged with the convenient prosecutions of has-beens like Charles Taylor and Slobodan Milošević. One of the critiques of transnational prosecutions based on universal jurisdiction is that they are a new brand of neo-colonialism, with former colonial powers seeking to bring into court disgraced leaders of their former colonies. Now the tables are turning, and this universal jurisdiction is not being universally welcomed. The applicant NGO challenged the refusal of the DPP and other government prosecuting authorities to launch an investigation into crimes against humanity carried out by Zimbabwean police against supporters of the main opposition party during the 2007 elections. They contended that this refusal was unlawful in the light of South Africa’s international law obligations and under domestic law. According to evidence submitted by the applicants, on 27 March 2007 in Harare, the Zimbabwean police, under orders from the ruling party, the Zanu-PF, raided the headquarters of the opposition party, the Movement for Democratic Change (“MDC”). Over one hundred people were arrested and taken into custody. 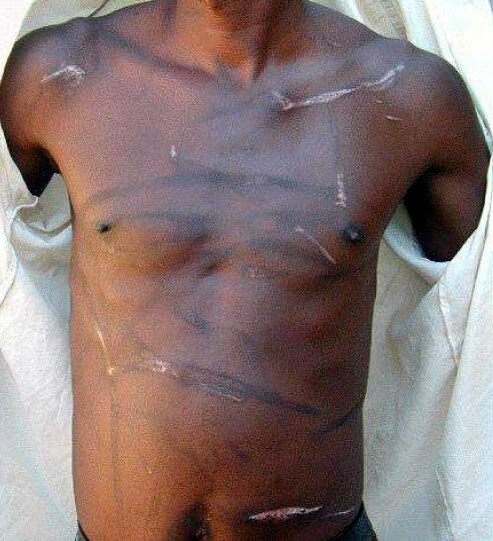 They were detained for several days, and were continuously and severely tortured. This torture, evidence showed, was part of a widespread and systematic attack on MDC supporters and officials and those opposed to the ruling party, the Zanu-PF. In the light of the collapse of the rule of law in Zimbabwe, concern for the safety of the victims, and the unlikelihood of securing accountability in a Zimbabwean court, the applicants maintained that South Africa was legally required to investigate these crimes against humanity, regardless of whether they were committed in South Africa or by South African nationals. They submitted evidence that those Zimbabwean officials identified visited South Africa from time to time and contended that, if and when they do so, South Africa was under a duty to apprehend and prosecute them if possible. The respondents refused to respond to the request to investigate, mainly on grounds of inadequacy of evidence. They claimed that, given the identity of the perpetrators and the circumstances prevailing in the country it was highly likely that the required evidence would have to be obtained in a covert manner, leading to possible accusations of espionage by the South African police force. no prosecution could ever succeed or even be instituted, let alone investigated if the relevant government was complicit in the commission of such crimes, as it would obviously protect itself and the particular perpetrators. First and Fourth Respondents’ view was therefore affected by irrelevant political considerations having regard to their duties. The judge upheld the applicants’ claim and granted a declaration that the decision by the respondents to refuse their request for an investigation for crimes against humanity under the Rome Statute was unlawful, inconsistent with the Constitution and therefore invalid. The head of the priority crimes investigation unit has been ordered to render all possible assistance to the head of the South African police in the evaluation of the request for the initiation of an investigation. The powers granted under the international crime jurisdiction were hugely welcomed when the UN passed the Treaty. But they come at a price. When faced with a request to exercise their own powers under this jurisdiction, the South African authorities dragged their feet, fobbing off the NGO with claims that the information it supplied was “insufficient”, and claiming there was no point investigating because the Zimbabwean authorities were unlikely to cooperate. They committed a fatal error, however, attracting particular scorn from the judge, when they contended that opening an investigation would likely chill relations with the Zimbabwean police and create political problems. The NGO applicants, said Fabricius J, were not only entitled to standing as representatives of the victims of the torture, but also of the general South African public “who deserve to be served by a public administration that abides by its national and international obligations”. There was no doubt that without the applicants’ action there was a risk of South Africa becoming a “safe-haven for torturers who may travel here freely with impunity.” It was legally irrelevant that the victims were tortured in Zimbabwe, because the ICC Act requires that they are to be regarded as having been tortured in South Africa. Applicants submitted that prosecution cases have to be made out of investigations. I was referred to S v Basson (1) in this context 2005 (1) SA 171 at par 37, which implied that if a state was under an obligation to prosecute offences, it was by necessary implications obliged to investigate such offences. He could not possibly uphold the respondents’ case, that, in effect, the South African police force and investigatory authorities could not investigate crimes outside of South Africa. If that were right, the entire conferral of jurisdiction on South African courts to try perpetrators of international crimes who are not South African, and who commit their crimes outside of South African borders, would be rendered meaningless. It would mean that South Africa would never be able to hold international criminals accountable because, according to the Respondents, they were paralysed to act. This was clearly not consistent with the purpose and object of the ICC Act. The decision will no doubt at least put a crimp in the travel plans of a wide range of Zimbabwean ZANU-PF party and government officials. I’m confused… if the Court has said that South African police and prosecutors SHOULD have investigated Zimbabwean torture, surely the headline is misleading: isn’t that a sign that South Africa, rather than ducking the problem, has taken a step towards tackling it? (albeit next time). We should not get too superior about this situation in Southern Africa. The law here was the same but the last government introduced changes in our law to exempt Israeli politicians from being subjected to legal actions for war and international crimes under the Geneva Convention. As far as I know, Israeli politicans and civil servants are still able to travel here with impunity despite being prima facie guilty of human rights contraventions and being prima facie guilty of crimes against humanity. British, American and Palestinian peace workers have been murdered in Israel and the Occupied Palestinian Territories and the perpetrators can still come to this country without having to worry about potential prosecutions. Israeli armed military and police services personnel are also guilty of human rights contraventions up to and including murder. There are companies and individuals in this country who are also prima facie guilty of collusion in war crimes but nothing happens about that.